Fall-off-the bone chicken is smothered in a rich vegetable-infused sauce. This One Pot Chicken Contadina or a Country Style Chicken is an easy Italian recipe for a hearty weeknight meal. Simple ingredients – insanely delicious result. 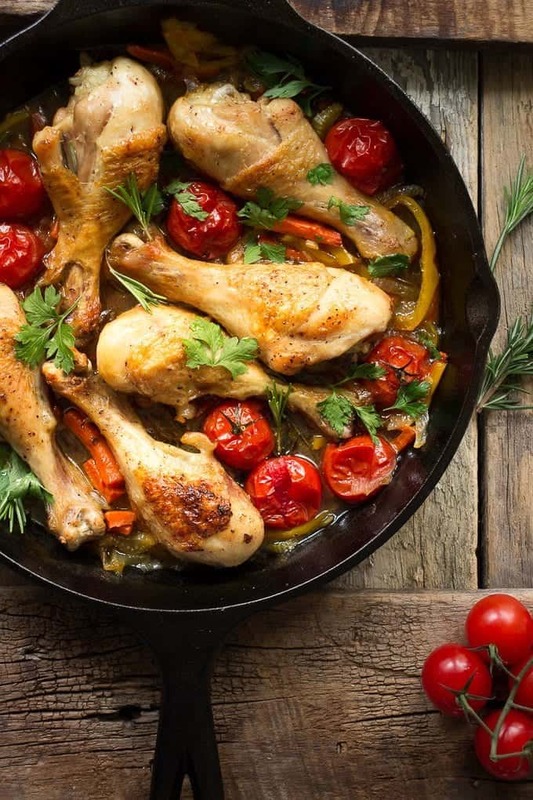 Say yes to low and slow stewed skillet chicken recipes that are bursting with flavor. Simple ingredients produce an utterly delicious and hearty dish perfect for any occasion. If you love recipes that require less work and cleaning, this Pollo Alla Contadina is the one to try. It’s a country style or farmer style chicken that is braised in simple vegetables that are often found on farmer’s table. Although this recipe is not widely popular in the US, you can easily make Chicken Contadina at home or try it in many Italian restaurants like Carmine’s in NYC, which menu got me inspired to write down this post. This classic Italian recipe is also quite affordable. 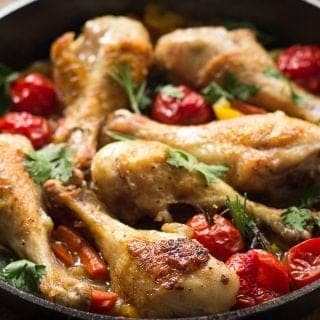 Here, you can use any type of chicken that you want and substitute Cherry tomatoes for regular tomatoes. Bell pepper is optional too. Not everyone likes it so if you fall into that category, simple skip it and add more tomatoes, carrots and onions. 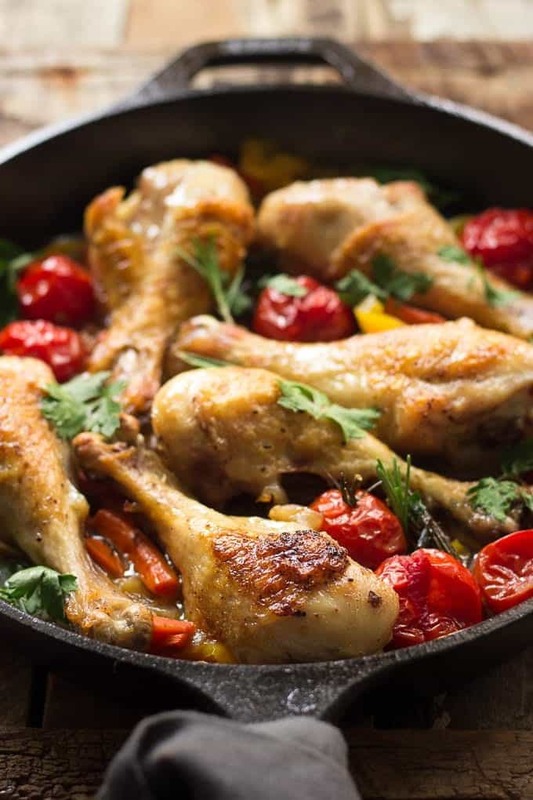 Mustard Chicken – my favorite French recipe that always a hit at the table. Serve this Chicken Contadina with my Roasted Garlic Mashed Potatoes and/or a simple green salad. Chicken Contadina is a healthy and affordable weeknight dinner for the whole family. Chicken legs are seared until crispy and then braised low and slow in an aromatic vegetables until tender. Heat 3 tbsp of olive oil in a medium 10-12 inch cast iron skillet and over medium heat. Season chicken with 3/4 tsp of salt and 1/4 tsp pepper and add it to a skillet. Sear chicken on all sides until nice and brown, about 15-20 minutes. Transfer chicken to a clean plate. In the same skillet, heat the remaining 2 tbsp of oil, add onion, carrot, bell pepper, celery, garlic and rosemary and sauté stirring occasionally for 7 minutes. Add wine and stir for another 5 minutes scrapping the brown bits from the bottom of the pan. 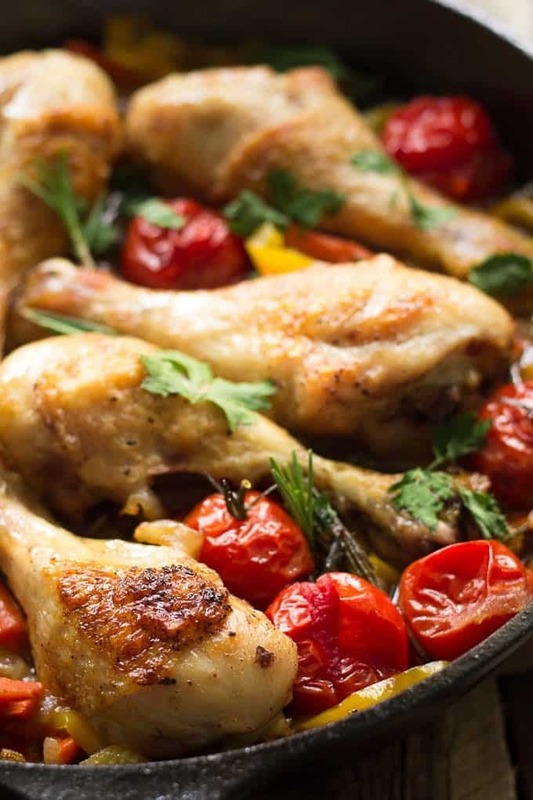 Add chicken broth, the remaining 1/4 tsp of salt, tomatoes, return chicken to a skillet and braise in the oven for 30-35 minutes or until the instant meat thermometer reads 175 F.
Carefully remove skillet from the oven, adjust the seasoning if necessary, sprinkle with parsley and serve immediately. You can also use chicken thighs or chicken breast. If you use the latter, I recommend cutting it into bite size pieces, brown on each side and then braise with vegetables for 20-25 minutes or until the internal temperature reaches 165 F.
Instead of Cherry Tomatoes, you can also use Grape Tomatoes or regular size tomatoes. If you choose regular tomatoes, use 2 and chop them into smaller pieces. If you make my Chicken Contadina Recipe, snap a photo and post it on Instagram with a hashtag #lavenderandmacarons. I’d love to see your creations. I’ve been needing new chicken dinner recipes so this is perfect! Thanks so much for sharing! This looks absolutely beautiful and scrumptious! I love making things in my cast iron and letting it slowly cook. great recipe. I have no idea how I have never heard of this before! It looks like a delicious Italian classic – I’m going to have to get on my mom about why she’s never made it – and send her this recipe! Haha! It is certainly delicious:) Thanks for your comment Lauren!